Quality, versatility and brand value is something which consumer associates with Samsung when it comes to electrical/electronic appliances. But air conditioner is a segment where Samsung hasn’t fared exceedingly well; at least in terms of market size. Off late, Samsung has made many innovative changes in its AC to make their offering more alluring to the customers. The wind-free triangular design is a quintessential example of that. Due to incremental rise in temperature every year and increasing level of aspiration amongst young Indian working class with higher levels of income and easy access to financing, ACs have witnessed double-digit growth in the past few years. This gives the fillip to the reputed the manufacturers like Samsung to bring out innovation meeting the needs of the customers. We will discuss all those latest and important technologies which new Samsung ACs offers. In 2018 Samsung has released the premium range AC with the revolutionary wind-free triangular design. These new high-end Samsung ACs are perspicaciously designed from the ground up to be very efficient. 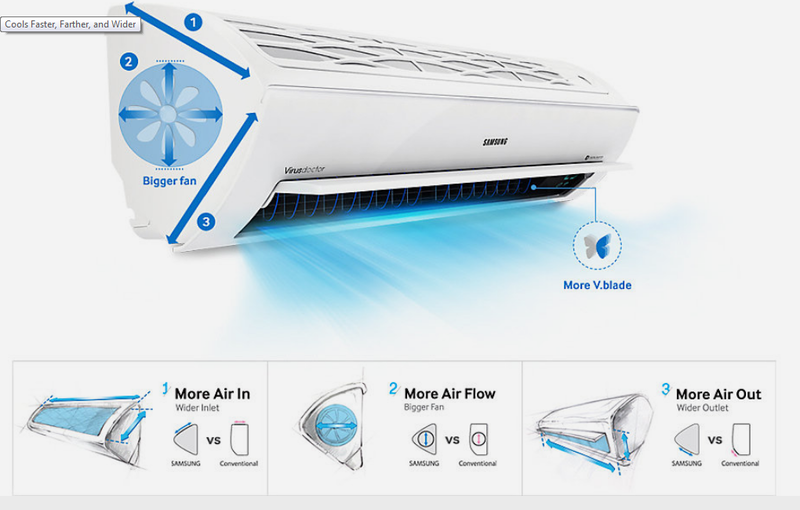 Moving on from the usual rectangular AC design, this new AC comes with a unique triangular design with a wider inlet to draw more air inside. Apart from wide inlet AC also comes with larger v-blades and a bigger fan. This renovated AC design ensures that the air is cooled faster, expelled quicker reaching the farthest part of the room expeditiously. Are you someone who always nags about feeling colder due to be airflow direction directly hitting your head? Well, Samsung has come up with a solution for that. Complimenting the triangular design, new premium ACs come with wind-free cooling technology that delivers the desired temperature by eliminating the direct airflow. It achieves this by delivering air through an alternate arrangement of 21,000 micro holes on the unit’s front panel as opposed to the usual direct air flow blades. When the louver is closed, they disperse a gentle flowing air, more aptly defined as “still air”. With the ubiquity of internet and rise of IoT (internet of things) going for smart functionality (or wireless connectivity) is becoming more of a need than a luxury for the customers. So, the new ACs especially the high-end ones come with Samsung’s Smart Home app to control the AC using the smartphone. Gladly, Smart Home app not only allows the user to regulate their AC but also control all the compatible Samsung appliances, that too from anywhere. Talking about AC specific controls, this dedicated app also allows the user to monitor their power usage, fan speed, and louver swing. Adding to Smart Control, new Samsung ACs also come with Smart Installation feature that performs self-diagnosis ensuring peace of mind for the user. It automatically checks for installation faults which can cause malfunctioning later in the smooth operation of the AC. Installation faults include checking the integrity of air pipe, refrigerant flow and communication mismatch between indoor and outdoor unit. Thus, Smart Home allows smart control of the AC while Smart Installation ensures fault-free installation with troubleshooting options. New Samsung ACs are armored with Fast Cooling mode to run the compressor at the maximum level, with the fastest fan speed for up to 30 minutes. While doing so, it brings down the room temperature quickly, converting the living space into a cool haven. After quickly cooling the room within 30 minutes, AC automatically switches to Comfort mode to maintain the desired temperature without making further increment in the temperature. This means users won’t feel unbearably cold when they turn on the Fast Cooling mode once the room is optimally cooled. Also, it eliminates the hassle of changing the settings to regulate the temperature. Summer season makes the AC overwork and with the monsoon to follow, ordinary ACs could fail to control the humidity or even result in water leakage. During the rainy season, conventional air conditioners not only consume more energy but also make the room uncomfortably cold which may lead to health ailment like sneezing, common cold or even headache. Samsung being an experienced brand have noted this problem specific to the subcontinent’s climate. As a solution to it, Samsung ACs come with Dehumidification mode. On enabling this mode, the refrigerant cycle is expedited to rapidly extract humidity from the room. Thus, Samsung’s new air conditioner removes excess moisture from the room so that the dampness vanishes. New Samsung ACs come with Full HD filter with improved filter design capable of decimating even the smallest microscopic impurities to prevent the user from the scourges of polluted air. With an improved density, this filter creates dust-free air circulation. The filter comes with an anti-bacterial coating to kill the resident bacteria. Another good thing is that it doesn’t wear out even when coming in contact with the corrosive elements. To compliment Full HD filter there is Virus Doctor feature. Virus Doctor eliminates dangerous airborne contaminants and viruses, including the Influenza A, subtype H1N1, and Corona viruses. We discussed the features and importance of filters used in the Samsung ACs. But one important thing on the part of the user is that AC’s filter needs to be cleaned regularly otherwise cooling capacity would be reduced. In fact, according to the studies an AC which runs daily for 6 months without cleaning and maintenance, it’s cooling capacity can diminish by up to 50%. In the fast-paced world, we often forget to clean and maintain our AC at regular intervals. But thanks to Auto Clean functionality of Samsung AC that runs automatically when the AC is turned off (provided user has enabled Auto Clean mode). Upon activation, the fan runs to remove the dust and moisture from the heat exchanger. This way it stays clean and dry deterring the ubiety of bacteria and mildew. Moreover, unlike the conventional filters that are often difficult to access, the Samsung AC’s filter is located outside, on the top. So, in case if there is a requirement to manually clean the AC, the filter can easily be taken out, cleaned and put back—without getting into the hassles of opening the cover or pulling hard to remove the filter. Cooling capacity is dependent on a number of factors and one of them is the number of people inside the room. More the number of people, more the AC needs to work to keep the room clean. So, there are times when you are completely alone in the air-conditioned room and start to feel cold even if the temperature is set to a higher value. Actually, being alone with the Samsung AC brings an opportunity to save electricity, thanks to its Single User mode. So, whenever user enables this mode, Samsung ACs changes their capacity, making inverter operate at a lower frequency thereby saving good amount of energy. Samsung believes this mode would allow the user to save around 26% of energy. Wake up stage: Allows the user to wake up with comfortable intermittent air sprinkled with freshness. Thus, Biosleep mode through its smart temperature control keeps the user comfortable, assist them to sleep faster, ensure uninterrupted deep sleep, and finally wake them fully refreshed. Samsung has innovated their heat exchanger design which helps them to reduce the size of the outdoor unit through Multijet technology. ACs coming with Multijet technology come with a minimalistic flat surface design that reduces air resistance compared to conventional heat exchangers. Multijet technology bolsters the heat exchanger performance resulting in faster heat exchange which in turn cools the enclosed room faster. Complimenting the Multijet, Durafin technology strengthens the durability of the heat exchanger by coating it with a combination of chromium and zirconium. This makes the outdoor unit corrosion resistant even in the highly corrosive environment like proximity to sea water. That is the reason why the premium models emblazoned with this feature have passed the difficult SWAAT test (sea water acetic acid test) certifying its corrosion-resistant performance. High-end split ACs from Samsung comes with an advanced 8-pole inverter technology. So, what is inverter technology? 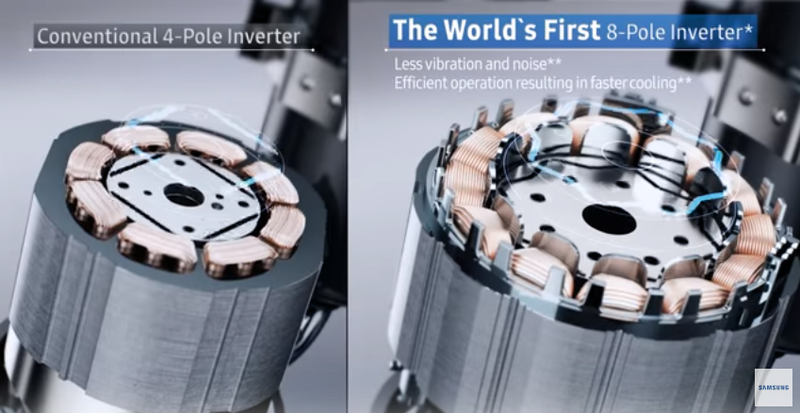 Well, to be really simple, inverter technology is analogous to the car accelerator. When compressor needs more power, it gives it more power. When it needs less power, it gives less power. With this technology, the compressor is always on but draws less power or more power depending on the temperature of the incoming air and the level set in the thermostat. The speed and power of the compressor are adjusted appropriately. Ordinary ACs come with 4-pole inverter but Samsung have redefined the inverter design and now premium ACs features 8-pole inverter which is more powerful and emits less noise ensuring quick cooling. Paired with the PowerBoost technology, the time needed for the compressor to reach maximum cooling speed is mitigated, rotations turn smoother, resulting in less noise, vibration, and friction. To compliment 8-pole inverter Samsung also comes with S-UTR (Ultra Tropical Rotary) compressor that assists in fast cooling the room even in severe hot Indian climates. S-UTR comes with a high torque motor to reliably maintain superb performance even in severe temperatures of up to 54°C for a long time. Samsung professes that S-UTR helps in saving energy consumption and increased energy efficiency by 10%. Power cuts and load shedding is commonplace in India, especially in distant towns and villages. ACs being a big electrical appliance are susceptible to vagaries of the supplied electricity. Power cuts generally poise the problem of a voltage fluctuation which can damage the air conditioner. Modern Samsung ACs are capable of tackling this problem, thanks to its stabilizer-free operation. The in-built stabilizer protects the AC from sudden voltage surge or drop. The stabilizer will cut off the electric input on sensing voltage surge/drop beyond the endurable range, and will auto start the AC once voltage comes in the normal operating range. Though the voltage stabilizer range varies from model to model, premium models like AR24MV3HETS come with a wide protection range—80V to 450V. One of the feature we liked most about Samsung AC is their design. The high-end models boasting a pure crystal gloss finish with a uniquely curved design exudes a premium royal look. Beyond the aesthetics, performance and utility of wind-free triangular design is remarkable. Other manufacturers would look to emulate it in their future AC offering. Certification of the AC from reputed institutes like Inertek and AHRI further enhances the credibility of the Samsung AC and not to forget that few premium models have also passed the difficile SWAAT test. Their stabilizer-free operating range of 80-450V is the best in the AC business. The scarcity of copper condenser is something we didn’t like about Samsung. Also, they only offer split AC so those who are looking for windows AC from Samsung would be left discontented. Despite of offering impeccable Full HD filter with auto cleaning option, the absence of PM 2.5/PM 1 filter is something which again disappointed us. To be honest, Samsung has been a struggling brand over the last few years due to the rise of Indian brands like Voltas, Blue Star, and Godrej. They needed something revolutionary and it seems the R&D team of Samsung has toiled hard for this purpose. The result is wind-free triangular design with an 8-pole inverter which has the potential to shift the tides in favor of Samsung if it delivers the optimum performance expected out of its pathbreaking design. The easily detachable Full HD filter ensures the tiniest microscopic impurities are removed giving out fresh, clean and odor-free air. Single user, Biosleep and Dehumidification mode allows the user to enjoy comfortable moisture-free cooling with minimal power consumption. If you are a Samsung fan but little jittery to buy a Samsung AC on account of its “not-so-good” brand image in the AC sector, this could be the right time to buy Samsung AC especially the models coming with wind-free triangular design for unobtrusive cooling.